From an early age, Paul had always been interested in how to achieve optimal health rather than simply avoid being sick and with a keen interest in science, Paul knew early on that Chiropractic was the right career path for him. 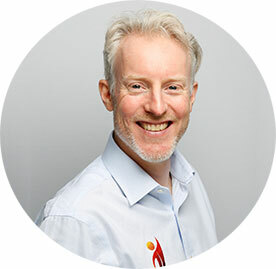 Paul moved to the UK in 1998 and quickly established himself as an influential leader in the UK profession through his involvement in the United Chiropractic Association. Winner of the UCA “Chiropractor of the year” award in 2010, Paul is also the Vice President of the association and heads the peer & ethics committee which allows him to fulfil his passion for helping other chiropractors in the UK practice safely and ethically. Paul now regularly takes time out from the practice to serve as an expert witness to help other Chiropractors with regulatory cases. As a father himself, Paul has a special interest in how Chiropractic can help mothers throughout pregnancy and in the important role of Chiropractic care in babies and children. He is a certified practitioner in Webster technique which can assist women with pelvic alignment in pregnancy. On a personal front, Paul loves to exercise and is a keen endurance athlete having run in 10 marathons. More recently he has been enjoying cycling having completed the Paris Brest Paris (a mere 1200km meander across France) twice! He also loves skiing and worked as a ski instructor for a couple of seasons alongside his chiropractic studies. He met his wife, Charlotte on a ski trip to Colorado in 2011 and they live in Hertfordshire with their son, Charlie who arrived in 2015.